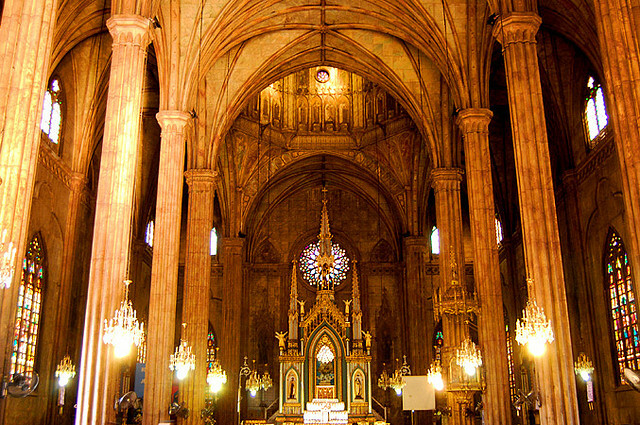 Make your Visita Iglesia more meaningful by visiting this unique and beautiful structure. Many city dwellers may have probably packed up and left the city for an out-of-town trip by now, while some may be compelled--for various reasons--to remain in the confines of the now quiet metro. Manila may not have the fresh summer breeze and glistening waters of the province but that doesn't mean that Holy Week here would be less interesting and meaningful. Here is one unique and historically significant church that you and your family might want to visit today for your Visita Iglesia. San Sebastian Church, formally known as the Basilica Menor de San Sebastian, stands tall behind the busy streets of Quiapo, Manila. The church is made entirely of prefabricated steel shipped in parts all the way from Belgium--an estimated total of 52 tons of material. The church was raised to a 'minor basilica' status by Pope Leo XIII in 1890 and was officially completed the following year. The church serves as the only all-steel church structure in Asia and the only religious edifice in the world made entirely of prefabricated steel. If that doesn't make this church interesting enough to warrant a visit, maybe Gustave Eiffel can persuade you. It has long been believed that Eiffel, the great engineer behind the Eiffel Tower and the Statue of Liberty, was involved in the construction and design of San Sebastian Church. Many historians and architects who have personally observed the church's structure believe that the steel fixtures of the church are very much like the work of the famous engineer-architect. Even his official catalogs 13 years before the construction of the church made a reference to the construction of a steel church in Asia. Experts are convinced that the church was originally designed and planned by Eiffel but was later on completed by Genaro Palacios. Why should you visit this church now? It's possible it won't be there for much longer. While the church retained most of its original design and structure, reports say that the steel fixtures that make it up are now slowly succumbing to rust and would require constant renovations. Some of the people responsible for renovating the structure fear that the cost of preservation would prove to be too great for the authorities to sustain. Talks of having the original building entirely taken down and built back up are being considered as it would cost significantly less than having the old parts restored. 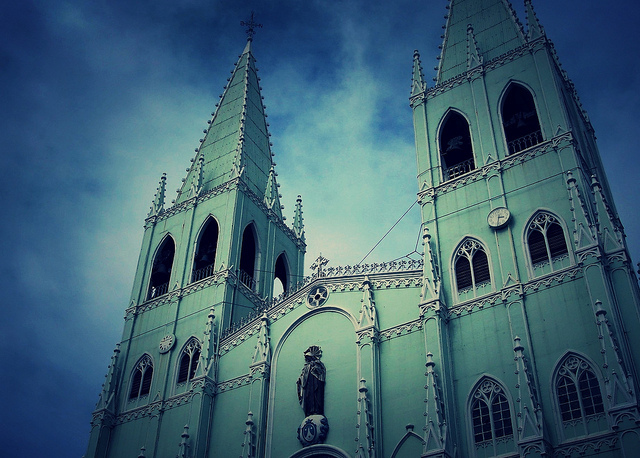 San Sebastian Church's beautiful neo-Gothic façade and interior makes it a popular venue for weddings and other events. There is rarely a day that no wedding is held here. So take this rare opportunity to enjoy some 'quiet time' in the usually chaotic city and be in solemn communion with our Lord while inside this marvelous work of art.